We met people enjoying, relishing, yea, even thriving, doing work with their hands. There’s something pleasantly appealing about people who work slowly, steadily and are rewarded with a visually stunning piece of handiwork. We met several such artisans this summer as we crossed the country. Some had small craft shops, some were simple hobbyists and some worked from home, living their creative dreams. Like most moms of small children, I have a lot of creative ideas I never get around to executing. I’m so happy for my friends who are able to see a creative, handcrafted idea from concept to completion. Like Joni Morgan. We visited Joni and her little family at their home in Michigan. They are dear friends we met while living California. Then they up and moved back to Michigan a year ago. Now Joni’s living her dream on the waters of Lake Michigan in famous Grand Haven. In the summer people go to Grand Haven for the Coast Guard festival, the beaches and the Pronto Pups (big corn dogs). We went there to see friends and try the more-delicious-than-a-silly-corn-dog fresh pretzels on the pier. I dare say the pretzels were better than the fresh German ones we savored when we lived in Deutschland. But I digress. I was talking about Joni. Joni and her handiwork. When she moved to Michigan she began to realize her dream of creating things out of wood, just as she had done as a child with her grandfather. Then she took the bold step of setting up an online shop and selling her wares. I say bold because it is BOLD. If that were me, I’d have doubts. “Will anyone want to buy these?” “What if someone places an order I can’t fulfill?” “What if no one likes them?” Whatever doubts she may have had, she overcame. And business is booming. You can visit her website and read her story at www.littleadventuretoys.com. 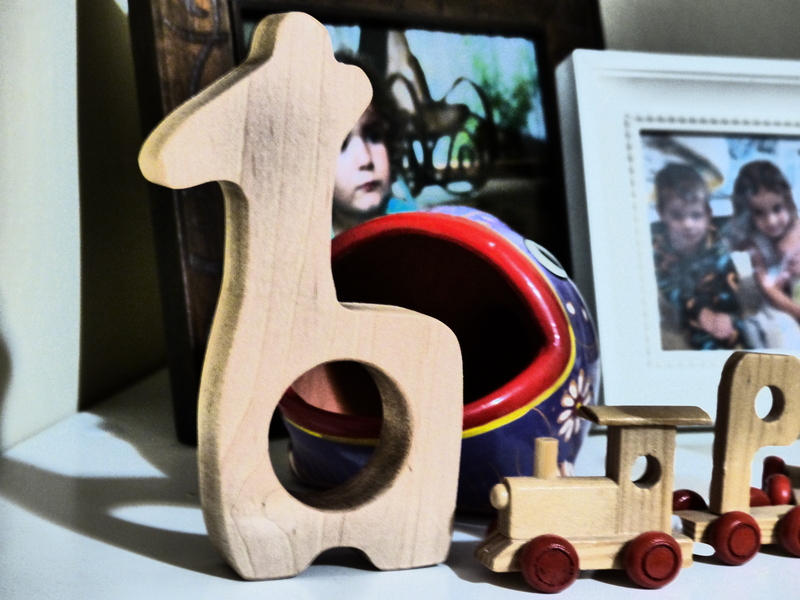 At Joni’s house I picked up a giraffe teether for our little boy who is expected to make his appearance in September. In our home, we affectionately call a giraffe a twiga, Swahili for giraffe. Giraffes are one of Joni’s most popular items. Who doesn’t love a twiga? Here’s ours, sitting on the shelf displayed as the art that it is until baby boy gets his hands on it and, at some point next year, seals it as his own with distinct teeth marks. In the photo below, the twiga is displayed with my daughter’s fish we picked up in Mexico and a wooden train we bought at a market in Bayeaux, France. All items bring back fond memories. The most special, however, are the ones whose creators are personal friends and elicit not only thoughts of a particular trip, but the friend we reconnected with along the way.